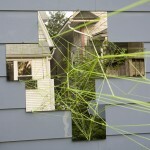 Sara Schnadt is a Chicago-based performance/installation artist. Raised on an international commune in Scotland, an ‘alternative’ context which considered itself as a social experiment outside of conventional culture, she spent formative years understanding herself as an outsider, an observer. Since moving to the United States in 1986, Sara has become fascinated with the unifying rituals and values that are common threads in contemporary western culture, and has made work that frames and resonates with those common threads. Formally, Sara makes performance and installations that use task, found objects, interactivity, projection, and movement derived from common gestures. Her work creates environments that shift the audience regularly from spectator to participant as the performer constantly moves between pedestrian and more stylized or evocative activity and the viewer negotiates spacial immersion in the work. Works often take shape as installations and live activities that translate data visualizations of large quantities of socially-resonant information into material, gestural and poetic form. 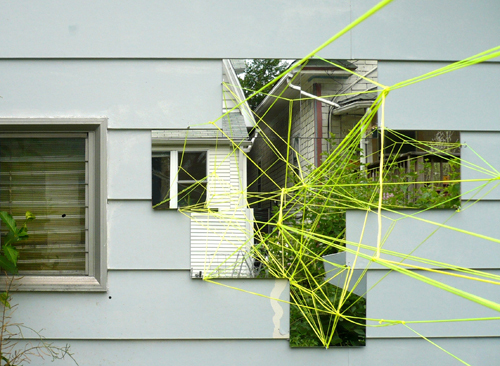 Since November 2009, site-specific versions of Network have been created in Chicago for an unused store front downtown and a gallery space at Hyde Park Art Center. For What it is, a version of Network will be created to inhabit the entire house that is the project space and artists’ live-work space and extend out into the garden. Visualizing the idea that we simultaneously live in a real and virtual world, and that the virtual is infinitely expansive, Network uses large quantities of electric yellow twine (tied in patterns based on both social network structures and Internet network infrastructure) to suggest a virtual network landscape cutting through an otherwise ordinary space. Artists/curators/residents Tom Burtonwood and Holly Holmes will also live with the work in their home for a month, negotiating their routines around it. A series of photographs will document their activity for the project catalog. Sara Schnadt is a Chicago-based artist working in new media, installation and performance art. She has shown her in work in Chicago at Hyde Park Art Center, Pop-Up Art Loop temporary gallery series, 12×12: New Artists New Work at the MCA Chicago, Looptopia, the Site Unseen Performance Festival, Balloon Contemporary, and at Antena Gallery. National and international shows include Exchange Rate public projection series in LA and New York, Upgrade! – Chain Reaction in Skopje, Macedonia, CINEA Paris, FreeManifesta in Frankfurt, and the Busan Biennale in Busan, South Korea. This looks fantastic. Congratulations, Sara!